Every Wednesday this month I will be sharing an amazing bacon recipe with all of you as part of Bacon Month. Make sure you scroll all the way to the bottom to see all the other recipes being shared by some amazing bloggers too. When I told the family I was making a Bacon Chocolate Chip Skillet Cookie they all had a perplexed look on their face. My daughter exclaimed "bacon cookies?" So let's just say everyone was just a tad bit skeptical. She was even so intrigued that she put down her cell phone to come and help me! Y'all know those phones are attached to their hands these days so I was happy to see her interested in what I was doing for a change. Anything to get her nose out of the phone! She even wanted to help me stir it up and put it in the pan. She is growing up on me way too fast! Once it hit the oven, she disappeared only to return when she heard the timer go off. 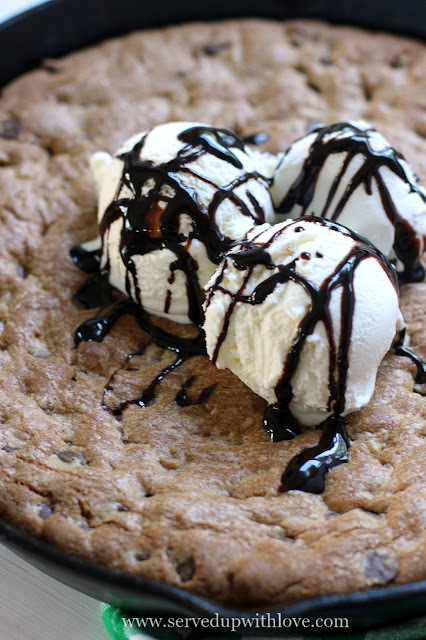 Who wouldn't come a runnin' when chocolate chip cookies are baking! She couldn't wait to dig in! Her eyes lit up when I loaded it up with scoops of ice cream and chocolate syrup and grabbed the spoons! Little bits of smoky, salty bacon is exactly what this skillet cookie needed. And of course, some ice cream! Preheat oven to 375 degrees. Combine flour, baking soda, and salt in a small bowl. In a large bowl, beat butter, granulated sugar, brown sugar, vanilla, and maple extracts until creamy. Add eggs, one at a time, beating well after each addition. Gradually beat in flour mixture until combined. Stir in chocolate morsels and bacon pieces. 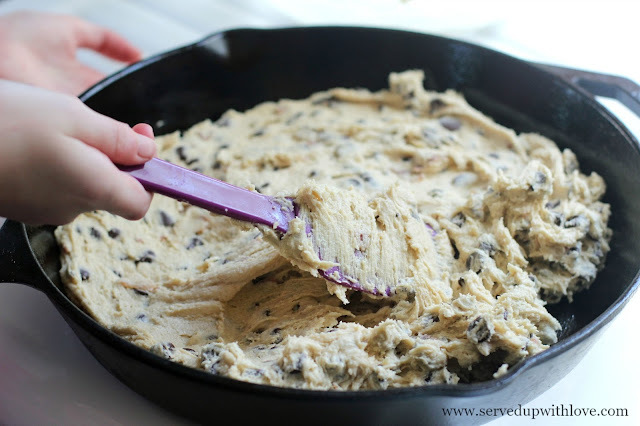 Pour into a well greased 10 - 12 inch cast iron skillet. Bake for 25-30 minutes or until golden. 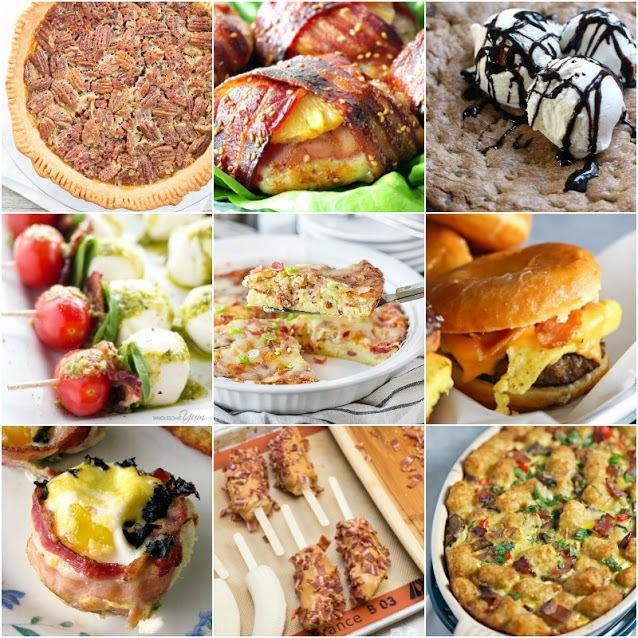 For the love of BACON, check out these amazing mouthwatering recipes. 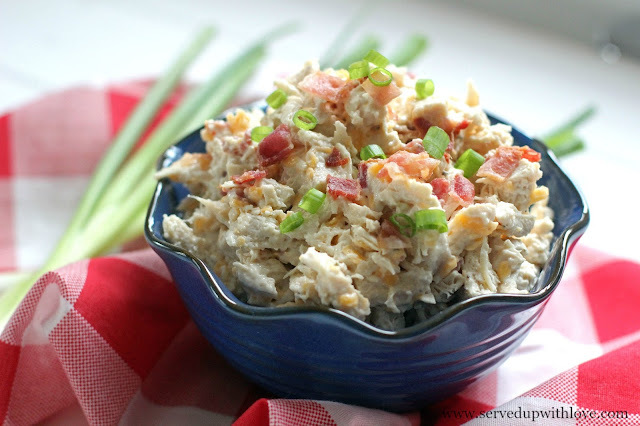 AND if you missed last weeks bacon recipe, Bacon Cheddar Ranch Chicken Salad it is one you do not want to miss. You can see it HERE! 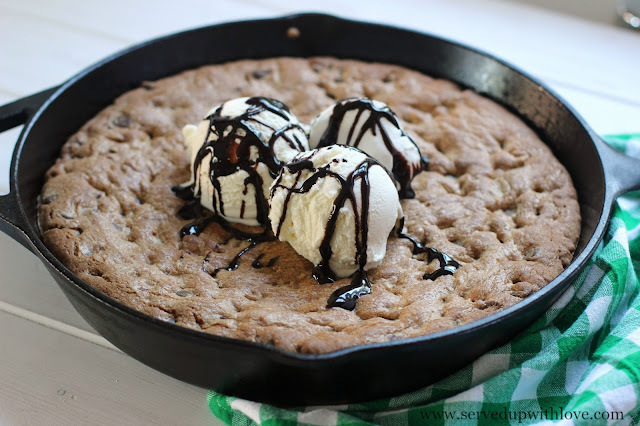 This is one fabulous looking skillet cookie! Time for me to get out the cast iron skillet! LOVE.THIS! 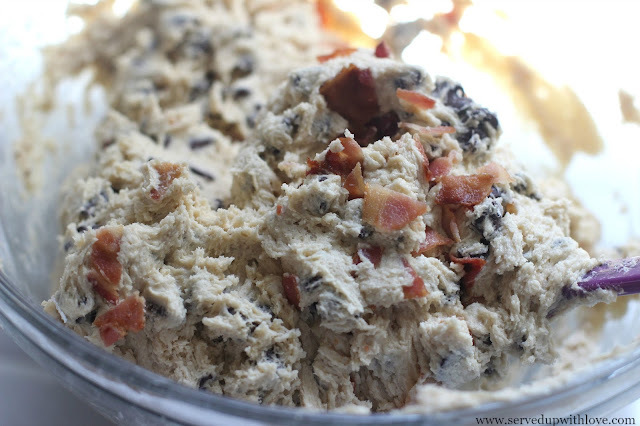 I make a bacon breakfast cookie (who's going to argue cookies for breakfast right?) that has peanut butter, applesauce, oatmeal and of course, bacon. Out of this world YUM. 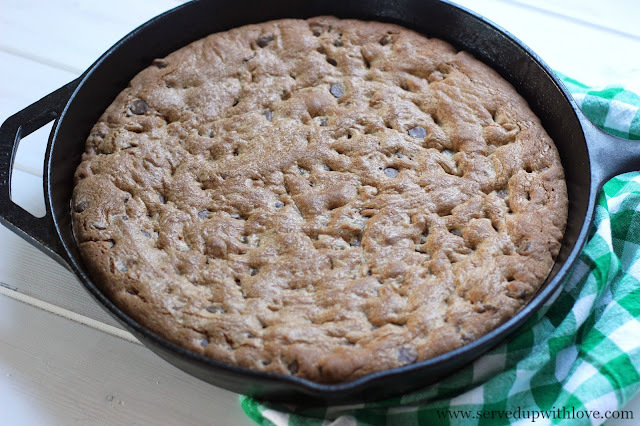 Thanks for sharing the idea of baking it in a cast iron skillet...I will definitely try that soon. 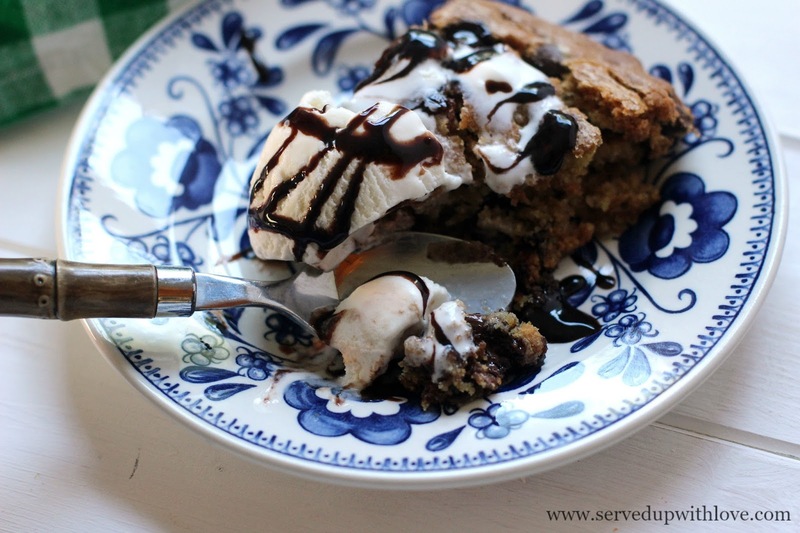 The recipe looks amazing,recipe is quite easy to cook out.Thank you for sharing.